The inhabitants of Last Chance, New Mexico, could not be more pleased. Dr. Jessica McLeod has opened an office right on Main Street. Andy Ryan, the best athlete the little town ever produced, has ended his short career in the NFL and has come home to coach the mighty Pumas of Last Chance High. Unfortunately, Dr. Jess immediately gets off on the wrong foot when she admits that she's never seen a football game, isn't really interested in doing so, and, in fact, doesn't know a first down from a home run. Meanwhile, Coach Ryan is discovering that it's not easy to balance atop the pedestal the town has put him on. When this unlikely pair is drawn together over the future of a young player--whose gifts may lie in the laboratory rather than on the football field--they begin to wonder if they might have a future together as well. 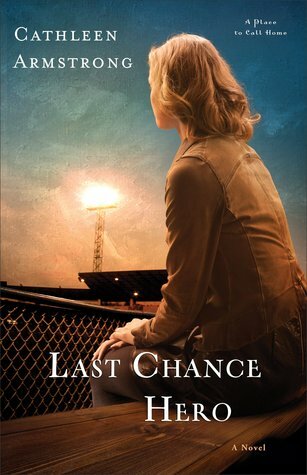 With the flair that has made her Last Chance books a favorite among readers of contemporary fiction, Cathleen Armstrong draws on the passion Americans have for the traditions of small-town high school football. I'll be honest. I'd completely forgotten about this series of books. This sometimes happens as the mom of two boys who keep chaotic schedules. When I first started reading, I kept thinking that something seemed really familiar about the book and sure enough, I have read at least one of the other books in this series. In some ways, this made the book feel like coming home. I already knew most of the characters. I can't say that I always understood Jess' stubbornness, but I certainly know people like that so I did enjoy that she was another totally real character. I enjoyed her story with Andy and catching up with everyone else, but again I'm going to be honest. I didn't enjoy the ending. It seemed abrupt and that there were a lot of loose ends. Now, if there's going to be another book in this series, I'm okay with that. However, I did read that this is the last book in the series and it just doesn't feel concluded and that always leaves me feeling unsettled. Still, if you enjoy every day life in a small town with some serious sports fanatics and love thrown into the mix...I can for sure recommend Last Chance Hero.